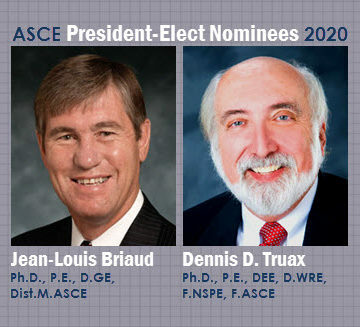 The official nominees for 2020 ASCE president-elect, as selected by the Society’s Board of Direction Nominating Committee, are Jean-Louis Briaud, Ph.D., P.E., D.GE, Dist.M.ASCE, and Dennis D. Truax, Ph.D., P.E., DEE, D.WRE, F.NSPE, F.ASCE. Briaud has taught at Texas A&M University since 1978, most recently as a Distinguished Professor since 2015. A Distinguished Member, Briaud has served in a number of Society roles. He recently completed a three-year term on the Board of Direction as a Technical Region Director, and has been president of the Geo-Institute (2008-09). He also led the Federation of International Geo-Engineering Societies from 2014 to 2018 as its president. 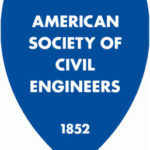 “Over the last three years, I have been a member of the ASCE Board. This experience has allowed me to learn firsthand what works well and what can be improved,” Briaud said in his candidate’s vision statement. Truax has spent nearly four decades on the civil engineering faculty at Mississippi State University, and has been the James T. White Endowed Chair and Department Head since 2006. He has also worked in the private sector, serving as a consulting engineer and principal for various agencies. Over a lengthy ASCE career, Truax was District 14 Director from 2001 to 2004, was appointed to two terms as the Society’s treasurer, and has served on many Society-level committees and groups. 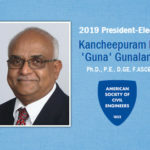 This includes his current role as vice chair of the Committee on Technical Advancement as well as current stints on the Engineer Tomorrow Review Task Committee and Student Competitions Task Force. At Mississippi State, Truax was ASCE Student Chapter faculty adviser for many years. He has served in multiple roles for the Mississippi Section, including president (1991-92). 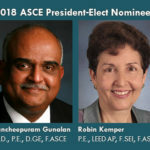 “I envision ASCE having a role in facilitating a productive working environment and personal accomplishment which will lead to increased membership in, and employer support of, this organization. I see my role as part of the ASCE leadership team as one of advocacy for the next generation of engineers,” Truax said in his candidate’s vision statement.